This delicious smoothie is easy to make with simple ingredients but is full of flavour and nutrition. Drink this when you need a boost for the immune system, it’s rich in vitamin C and antioxidants. Try it as is or reduce the liquid to make a healthy smoothie bowl topped with blueberries and granola. Add all ingredients to a high-speed blender and start blending on low. Slowly increase speed, continuing to blend until it’s completely smooth and creamy. You may need to stop a few times to mix it. Give it a bit longer than you think it needs to allow all the flavours to mix together and the beet to completely mix in. 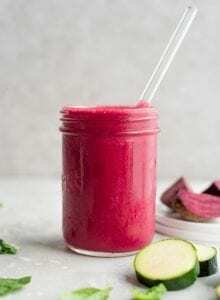 This smoothie does have a hint of beet flavour to it so if you’re not a big fan of beets, I’d suggest adding half a frozen banana for extra sweetness. To make this as a smoothie bowl, add the optional frozen banana, reduce the liquid slightly then blend on low until it’s thick and creamyh, scoop into a bowl and enjoy with a spoon.